This species has brown wings, each forewing having a ragged white stripe from base to margin, a thin submarginal white line, and various faint labyrinthine markings. The moths have unipectinate antennae. The male moths have a wingspan of about 10 cms. 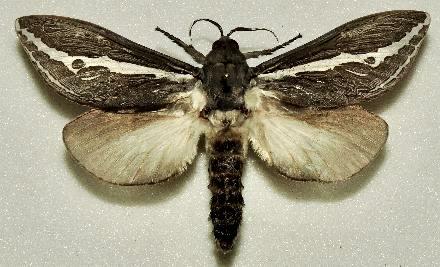 The female moths have a wingspan of about 15 cms. CSIRO Publishing, Melbourne, 2018, pp. 26, 51 57, 59, 67-68, 189, 212, 232, Plate 2: figs. A and B, Plate 44: fig. A.
Clarendon Press, Part 1 (1892), pp. 289-290, No. 1343. Volume 4, Part 4 (1932), pp. 533-534, figs. 58, 59.